When you go to buy tickets for a popular concert or sporting event, you likely know that you’ll ultimately have to make your purchase from a ticket reseller who will mark up the price to try maximize their profit. But the New York state attorney general is calling on the state legislature to put new rules into place that would protect consumers from scalpers who swoop in and buy up every ticket before they are available to actual fans. “Ticketing is a fixed game,” said NY Attorney General Eric Schneiderman today, as his office released the results of a three-year investigation [PDF] into the event ticketing industry. In 2007, the state legislature repealed a number of the so-called “anti-scalping” laws to better adjust to the growth of new online resale marketplaces like StubHub. Schneiderman acknowledges that this change did result in benefits to consumers — the ability to resell unwanted tickets, guarantees from legitimate brokers that their tickets were not fake, not having to deal with scammy scalpers standing in the shadows outside of Madison Square Garden only five minutes before the start of a game. “Yet many of the problems described in 1999 have persisted and, in some cases, have grown worse,” reads the report. It points to the increase in ticket resale prices, counter to the economic behavior that usually occurs when online competition is allowed. Instead of being able to get tickets for popular events at more affordable prices, New York residents have complained about events being sold out instantly, higher prices, and hard-to-justify fees being tacked on. The report points to a Dec. 2014 U2 concert at Madison Square Garden. The show, like many others, purported to have a 4-ticket maximum. But within a minute of the tickets going on sale, one broker was able to purchase 1,012 tickets, likely by using automated bot software that does the purchasing for them. 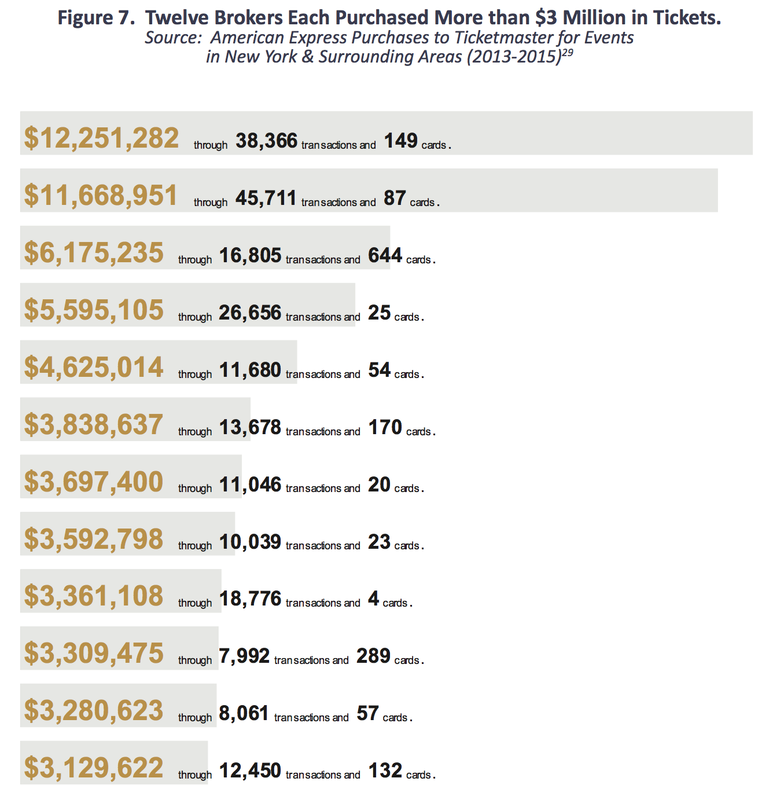 As you can see from the chart on the left (click image to enlarge), between 2013-2015, a dozen different brokers in New York each purchased more than $3 million in tickets. Two brokers were each able to pass the $10 million mark, using nearly 250 different credit cards between them. Making things even more difficult for fans is the fact that many tickets to high-profile events are either held back from public availability and doled out to VIPs by promoters, the artists, the venue, and others connected to the event. Then there are the pre-sale blocks of tickets that are only sold to people with certain credit cards (often American Express, though the report doesn’t call them out by name). By reducing the total number of tickets sold to the public and allowing brokers to purchase massive numbers of tickets quickly, the actual fans often have little choice but to turn to the resale market. 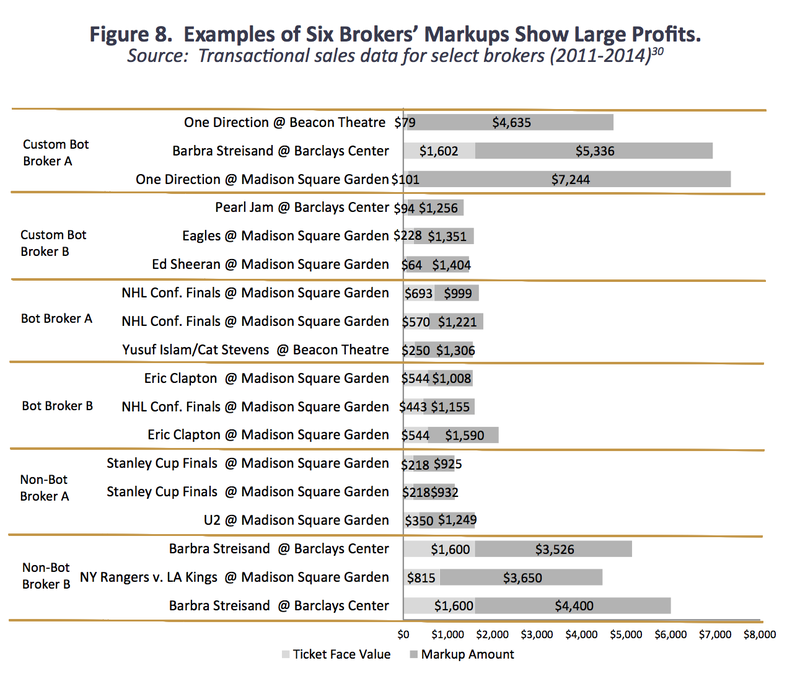 This chart shows examples of how much brokers are able to mark up tickets for certain popular events. Click to enlarge. This built-in scarcity allows brokers to charge sometimes ridiculous markups on the secondary ticket market. The chart to the right shows a number of examples, like One Direction tickets that sold for $4,635 — nearly 60 times the $79 face value. Without legal incentives to deter price-gouging and the use of bots, one way to combat these huge markups, argues the report, is to reinstate price caps on the resale market. “Reinstating caps on markups would still allow brokers a role in the market but would also ensure that any price markups be reasonable,” concludes the AG’s office. Before price caps were removed in 2007, brokers could charge a maximum of 45% above the face value of a ticket, meaning that One Direction ticket would have only been able to sell for about $115 instead of more than $4,600. The AG’s report also calls BS on many of the exorbitant “service fees” charged by venues and ticket sellers. Between the venues and the ticket vendors in the state, New York residents pay an average fees equaling 21% on top of the face value of their tickets. “Moreover, we found fees as high as $42 attached to a ticket to see Professional Bull Riding at Madison Square Garden and $28 to see Janet Jackson at Jones Beach Theater,” reads the report. The AG calls out the NFL’s Ticket Exchange resale market for its use of price floors, meaning that resellers on the platform can’t unload their tickets for lower than face value. So even when your team is 2-10 and you’re enough of a masochist to sit out in the cold and watch them get trounced again, NFL Ticket Exchange still requires that you sell the ticket for more than you paid — even if that means no one will buy it from you. This is particularly troubling in the case of Ticket Exchange, notes the AG, because of how the NFL pushes it as the league’s only “official” secondary market, and the only “safe” place to buy secondary NFL tickets. One of the more bizarre ticket-related laws in New York is its ban on non-transferrable paper tickets. Meaning you can’t eliminate scalping by saying that the buyer of the ticket has to be the person who attends the event. According to the report, New York is the only state with such an outright ban on the practice. There are obviously benefits to being able to transfer tickets — you can resell them, give them as gifts, or give them away if you change your plans last minute — and Schneiderman is not recommending that the state require that all tickets are non-transferrable. Rather, he’s calling on the legislature to lift the ban so that artists, venues, and promoters who want to issue non-transferrable tickets in the state can.